Sputnik presents five interesting facts about the German chancellor's personal life. The incumbent German chancellor grew up in a pastor’s family in the German Democratic Republic. Although the authorities kept an eye on children from religious families, Merkel never complained about being treated unfairly. “My childhood was unclouded,” she said, according to the German broadcaster DW. Thanks to her East German background, Merkel speaks Russian, however, scarcely uses it. Vladimir Yakunin, who climbed from being an intelligence officer in the KGB to the CEO of Russian Railways, revealed in his memoirs that she was allegedly “in thrall to some phobia” about Russia after her bicycle had been stolen by a Soviet soldier, as she reportedly told him. German Chancellor Angela Merkel and Russian President Vladimir Putin at the Bocharov Ruchei presidential residence, Sochi. The “bike issue” isn’t the only anxiety that the German chancellor has reportedly had to deal with during her course of work and visits to Russia. Her great fear of dogs also came into public attention during her meeting with Vladimir Putin in Sochi in 2007, where he let his late Labrador Konnie, who gave the German leader a hard time, sniff around and settle at her feet. In 2015, a retro photo of three naked girls walking on a beach, all three widely smiling and careless — naturism was gaining popularity in East Germany — emerged online. Some debated one of them was the German chancellor, who was running for a third term around the time the picture was published. However this was not confirmed. In the wake of her career, Angela Merkel bragged about her cooking skills. Her specialty was reportedly a plum cake. The further she climbed up the political ladder, the less time she had for her hobby. Even while she was a minister, she could dedicate several weekends to baking during plum season. Although reports about her cooking endeavors have faded since becoming chancellor, she is occasionally spotted queuing at stores in her neighborhood. Besides becoming one of the longest serving chancellors in German history, Angela Merkel was there to watch another historical breakthrough for her country — Germany’s victory at the 2014 FIFA World Cup. 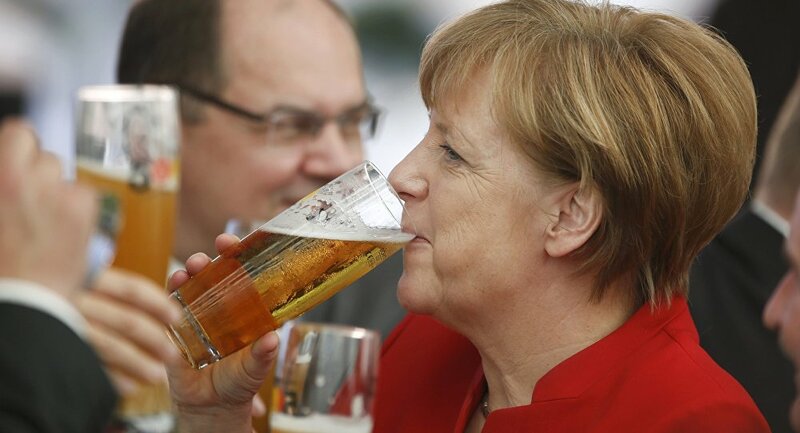 However, she is no stranger to football: since 2005, when she took office, she has repeatedly been spotted in stadiums supporting the German national team, as well as in changing rooms with half-naked players.